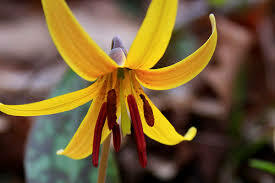 Trout Lily Super Sale! Common Ground Fair! Camping at Eastern! THE FAIR! See us at the Maine Common Ground Fair Sep 21-23 in Unity. We are booth #3 in the Ag Products area, facing a paved walkway. We will have great plants for sale including wildflowers and rhodos. Last year we took first prize for most educational booth. This is a huge, traditional agricultural fair that is a must. People come from all over the U.S. to attend. We have 100% positive reviews… here’s one from Anna: Mark is a wonderful host and delivers a unique camping experience tucked away in his secluded property and vast nursery. The Babbling Brook site is very private and fit two tents along with a very well-built fire pit. Easy access to an outdoor toilet and water provided. Very near Reid State Park. More sale offers to come but don’t wait as the Trout Lily always sell out. Greetings camping and garden friends! After much hard work we can now say our tent campground is opening. A rare plant nursery and scenic campground all in one …the only place like it. Tent camping with scenery all around you in mid coast Maine! Tall pines, fragrant firs and all the neat flora of Coastal Maine surround you at our lakefront property in Georgetown, Maine. Note: lots of pics here, might take a minute to load! These are not your typical campsites all jammed together. If you’ve been here you know how scenic our property is …but few have seen the amazing back property featuring a meandering stream, beaver pond and dramatic cliffs with moss covered boulders. Our tent campground now showcases that beauty. Come experience it …it is truly park-like. Two sites have great fire pits …all sites are near or on our stream and have direct access to a logging road and hiking on the 140 acre nature reserve. Pine needled trails and pine needles at the tent sites for comfortable sleeping! Two sites are near our beaver pond with the sounds of frogs and sights of great birdlife including Bald Eagles, herons and more. Two sites are accessed by small footbridges over the stream. There are moss covered boulders and dramatic cliffs near the Morning Mist, Babbling Brook and Cedar Meadows Sites. We are centrally located near Bath Maine with many major Maine attractions within a days drive. The Red Door Site red door! Where did it come from? And where is the rest of it? That door has been there since we bought the property in 1988. There are enclosed high quality portable toilets with fans and lighting. Discretely placed solar and motion lights for ambient light to get you around in the dark. For an additional fee we can provide a tour thru our abutting park-like nursery, there is no other nursery like it. See the largest collection of rhodos in northern New England. Swimming: We are close to Reid State Park and it’s famous sandy beach. Plus, a few miles up the road is Sewell Pond, a noted swimming area. With so many campgrounds overcrowded, here is your chance to experience the Maine woods in a private way …like it used to be. BBQ: Sites 3, Morning Mist and 4, Babbling Brook, have cool BBQ pits. Scenery: Dramatic rock bluffs and moss covered ledges are near the campsites. Don’t forget the meandering stream. FOOD: The general store is two miles away …a nice walk or bike ride. The historic town of Bath is less than fifteen minutes away. Come camp …it’s a great back to nature place! Here is a description of each tent site. Sorry no RV’s. Site 1– Red Door site, overlooks a scenic beaver pond with waterlilies and cattails. The sounds and sights of frogs, birds and deer are all around you. It is a short walk to the lake, Bald eagles frequent it. $29 per one or two people, $6 for each additional. Site 2– Frog Hollow site, is near a stream and beaver pond with waterlilies. It is a short distance from site 1. For larger groups consider booking both site 1 and 2. Also a short walk to the lake where eagles hover. $29 per one or two people, $6 each additional. Site 3– Morning Mist Site, is accessed over a small foot bridge and has a larger footprint. There is a gentle rise in back of the site, and it too is near a lovely, rock strewn meandering stream. Morning sun fills the area. There is a gorgeous fire pit. $38 for one, Flat rate $43 for two to 4 people. Babbling Brook site is accessed by a different footbridge over the stream and small waterfall and is very private. The site itself is close to the stream and has a cool firepit. Cascading over rocks the stream can be easily heard and adds a relaxing feel. $38 for one, or Flat rate of $43 for 2 to 4 people. Cedar Meadows site is the most private with a serene view to a salt marsh and tall pines. The stream empties into it creating a small waterfall by the footbridge. It’s the largest site. Nearby is a dramatic cliff. $38 for one, $43 for 2 to 4 people. $6 for one more, totalling $49. TENT CAMPING AT EASTERN PLANT IN GEORGETOWN MAINE …COME STAY! We are centrally located in lower midcoast Maine. With so many places to see nearby, our campsites are a great destination point. Work continues on the build out of our five special campsites. A water line is now installed to sites 1, 2 and 3. Those sites are now named. Site 1–Red Door Site, Site 2–Frog Hollow Site, Site 3–Morning Mist Site. Sites 4 and 5 will be named soon. It is somewhat unique for each tent site to have its own water spigot…all five will. A firepit was built this week at site 4, and will be built tomorrow at Site 3, the Morning Mist Site. We will be setting up the portable flush toilets in a day or two. They will have enclosures with a fan and lighting and subtle, outside motion activated lighting leading the way to them. All sites will be less than 200 feet away from one. Sites will be $29 to $40 for two people, slightly more for extra campers. Our tent sites will be an incredible spot to spend some quality time…dont forget fall foliage season! Rhodo bonanza: do you know Eastern Plant has one of the largest rhodo breding programs in the country? We do and now that we have an excess we can share promising young ones to you at very low cost. These will be a mix of one, two and three year seedlings, old enough to stand the winter. We cant promise colors but can promise they are hardy for us here. We will select those best for your area. Not just any rhodos! These are all hybrids we have made here from superior parents that are hard to get. If you’ve been here, you know about our incredible rhodos…we feel, as do countless others the best in the business. Populate your forest and garden with them, then look forward to bloom for years to come. WE ARE THE ONLY SOURCE OF MAINE GROWN RHODOS THAT WINTER OUTSIDE FROM YEAR ONE …THEY ARE TOUGHER THAN ANY OTHER RHODOS. For this special offer you must buy ten or more, but they are only $7 each. We are certain many will turn out to be a star performers. Inquire! Shipping for ten will be about $11 to most areas and starts in Sep–Nov. WE CARE and will only sell them to areas where they have a chance of doing well. Fall is an excellent time to plant them. Eastern Plant…only the finest rhodos! Tent Camping at Eastern, Update #2 and Rhodo bonanza! Lets talk toilets! We will have enclosed, high quality portable toilets at the campsite area, a big upgrade from the pit toilets we had mentioned. They will be only a short walk from the sites. We will have some sort of dim lighting near each one so they are visible at night, with an integral fan and light inside so you aren’t pooping in the dark. Site 4 is accessed over a small foot bridge, is secluded, with fire pit and near a stream. The stream can be heard at the site. Here’s a few pics. Small footbridge to site 4, ferns in abundance! Lucas building site 4, a fire pit will be right next to stream, just out of view. We are swimming in two and three year old seedlings from our hybridizing program, one of the biggest in the U.S. we will be selling these at only $6 each this fall, when you but five or more. All are hardy and beautiful. INQUIRE!!! Camping at Eastern Plant: exciting update! This is first update since announcing camping at Eastern Plant. Work has begun and five outstanding sites have been selected. All sites may see deer, and other harmless wildlife. Did we mention Bald Eagles frequent the area. Two sites will overlook a large active beaver pond and be near a stream. Those two will also enjoy the playful sounds of frogs. One site will be in the midst of the forest, near a stream and high ridge with access over a foot bridge. Another will be near stream, second footbridge and small waterfall. The fifth site will have a gorgeous view to a salt marsh, and be near a stream, small waterfall and dramatic vertical cliff. Large glades of ferns are near most sites. These are not your typical campsites! All sites are spaced apart for privacy, with the last site being the most private. Again, all sites will have their own cold water spigot. Unique among campsites! We will be doing more cleanup and start of trails tomorrow. Our target opening is August first…which may be optimistic…but we will try. Contact us at 207 607 1284…text is best but calls are ok.
Tent Camping at Eastern Plant in Georgetown, Maine! Bookings are happening …we hope to see you. Camping is coming to Eastern Plant soon! Nature at its finest in Georgetown, Maine! We will have four campsites in the back of our Property..all private…all near a stream, or tidal bay. There’s a big dramatic cliff nearby…and almost a cave. Enjoy Maine the way it was meant to be. Our location in Georgetown, Maine is unique. A pristine coastal forest is here to greet you. Deer, bald eagles and amazing bird life frequent the area. There’s an active beaver pond also. Our picturesque lake is there for fishing or canoeing. Running cold water is at each site. Pit toilets for your comfort! …hey it is back to nature. Your camp area abuts a 120 acre nature preserve you can also hike on and another big nature preserve, the Josephine Newman abuts that one! Plenty to explore and not overcrowded. On some nights you can hear the surf at the beach a few miles away. To get to your campsite you drive thru our forest nursery filled with rhododendrons to a small parking area, then it’s an easy five minute walk to the campsites. This is strictly tent camping. The general store is only two miles away with supplies. We plan on barbeque nights…more to come! CALL OR TEXT 207 607 1284 for more info and pricing. Tell your friends…well give you a discount on your next plant order for completed referrals.